I don’t have too much to say for this week, but we were able to find and talk to a whole lot of people and pick up some new investigators too! 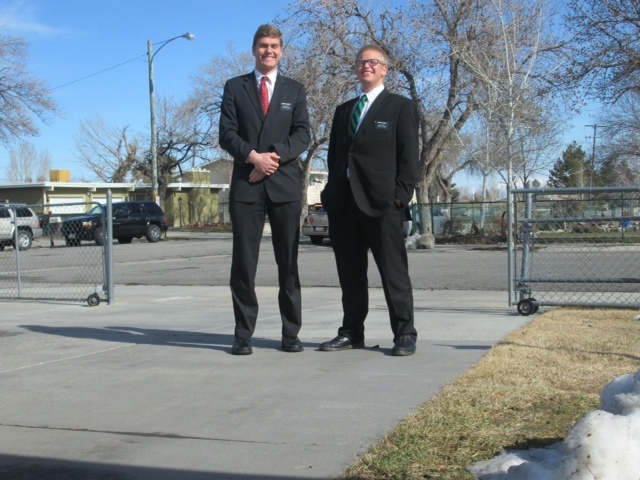 Elder Glaves and I get along extremely well and a lot of good has come from it too. This week was filled with a lot of inspirational moments between the two of us. We didn’t have any baptisms but we are working on getting there soon. We had a lesson with one of our investigators who used to be from the Fundamentalist church (FLDS). As we were getting ready to close, I got a thought in my head to talk to Melissa about the Atonement, only to find out that her religion doesn’t pass the sacrament or teach/practice the Atonement. To be honest, I thought it was extremely mind blowing considering the fact that she actually had her own quad (Old Testament, New Testament, Book of Mormon, and Doctine & Covenants/ Pearl of Great Price). I honestly thought that most religions would actually teach/ practice that because it is something that brings you a lot of hope and faith that everything is going to be alright, but I guess we all have our own opinions right? The weather here is FINALLY warming up so I am extremely happy about that, and I know that it will definitely make the work a little more fun knowing that I won’t be freezing cold while out talking to people. Well, that is about it from me, I hope that all of y’all are continuing to do well back home. I miss & love all of y’all!